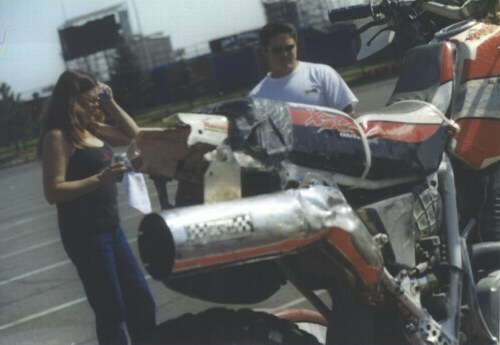 My Mom, and Marty Seefriend, one of my riding partners in the Vegas to Reno race 1999 assessing the damage to the bike after the I took it down a 50 to 60 foot embankment. That happened only 15 miles off of the startline. After some "desert frame straightening" (putting the bike between two trucks and using a come-a-long) we went on to finish and took 3rd in class. The fall broke the swing arm bolt, and twisted the frame so badly it was out of line by four inches ( to the side).